Dress up the big brake kit you’ve added to your JL – or the existing stock brake rotors – with a set of 2018-2019 JL Jeep Wrangler caliper covers made in one of several clean, crisp colors that add some visual zing to a functional part of your vehicle. 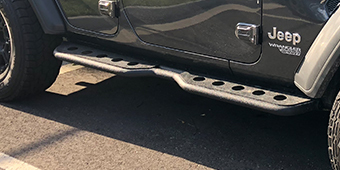 These caliper covers are sold in sets of 4, so that you can kit out your entire Wrangler front and back with them after buying a single example. The powder-coat finish used on them is gleaming and glossy surfaced to catch the light, and comes in several different tints. Black caliper covers are dignified and stealthy, while bright red ones offer a fast, sporty look. If you’re the cheerful type, you might prefer a sunny yellow set of covers instead. Regardless of which you prefer, all of them come with engraved lettering in a contrasting color (white for the black or red covers, black for the yellow covers) which spell out various words – Jeep Wrangler, Mopar, Wrangler, etc. Underneath the coating, these covers are made from airplane grade 6061-T6 aluminum, formed through a hydraulic process for both strength and precision of fit. 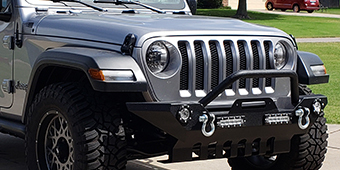 Most mount using stainless steel clamps that share their resistance to rust and road chemicals. These caliper covers provide a visual flourish to your Jeep Wrangler, but they’ve also got a useful application – they cool the operating temperatures somewhat and cut down on the amount of brake dust as well.